PHOTO: Allen Ramsey, DWCPhoto.com. Highlands senior Justin Weyer goes up for a shot in a recent game. 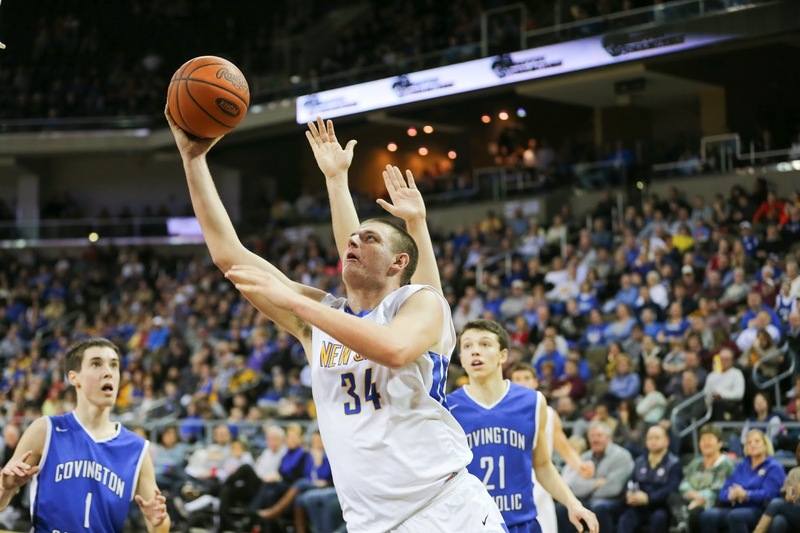 The Newport Central Catholic Thoroughbreds cruised through another All “A” State Tournament quarterfinal on Friday at the Frankfort Civic Center. PHOTO: Allen Ramsey, DWCPhoto.com. Highlands Junior McKenzie Leigh goes up for a shot in Thursday's game against Holmes. It had the same feeling as Saturday. The Newport Central Catholic Thoroughbreds boys basketball team had no problem taking care of its first-round opponent to start the All “A” State Tournament on Thursday. PHOTO: Allen Ramsey, DWCPhoto.com. Newport Central Catholic's Zack Pangallo goes in for a score in a recent game. The Thoroughbreds open the All "A" State Tournament Thursday against Hancock County at 11:30 a.m.
It’s been a challenge they’ve handled the past two years and it is one they hope to do again and enter the history books. 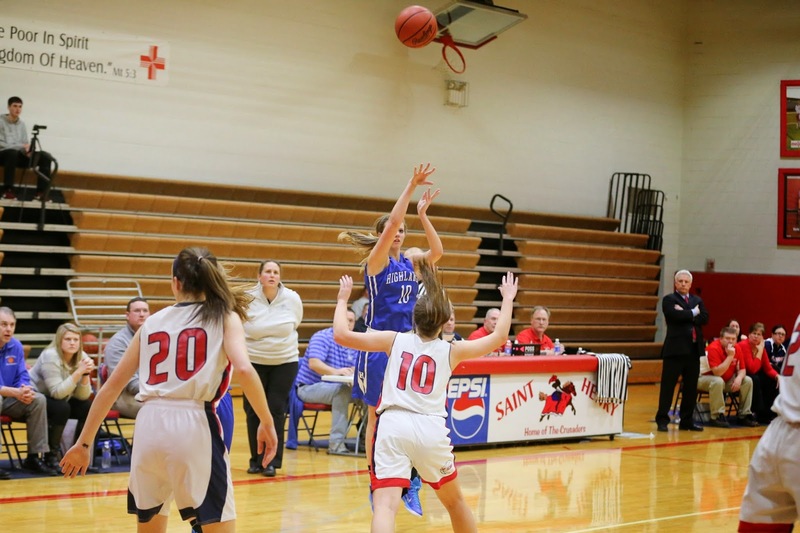 The Newport Central Catholic Thoroughbred girls basketball team (13-8) secured the second seed in the 36th District Tournament with a convincing road win Wednesday. PHOTO: Allen Ramsey, DWCPhoto.com. Newport Central Catholic junior Erik Anderson draws a foul in a recent game against St. Henry. The Thoroughbreds defeated the Bluebirds for their 10th straight in the series Tuesday. PHOTO: Allen Ramsey, DWCPhoto.com. 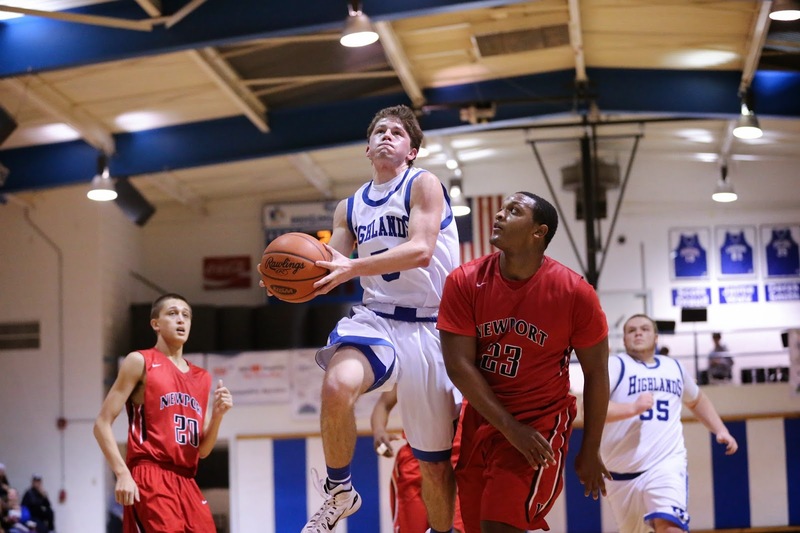 Highlands junior Chandler New (3) goes up for a shot in a recent game against Campbell County. The visitors wanted to maintain their superiority in the 36th District and the hosts hoped to show they’ve closed the gap. PHOTO: Allen Ramsey, DWCPhoto.com. Highlands junior Brianna Adler (10) puts up the shot that put her in the 1,000-point club while St. Henry's Connor McGinnis (10) and Taylor Potts (20) get in position. 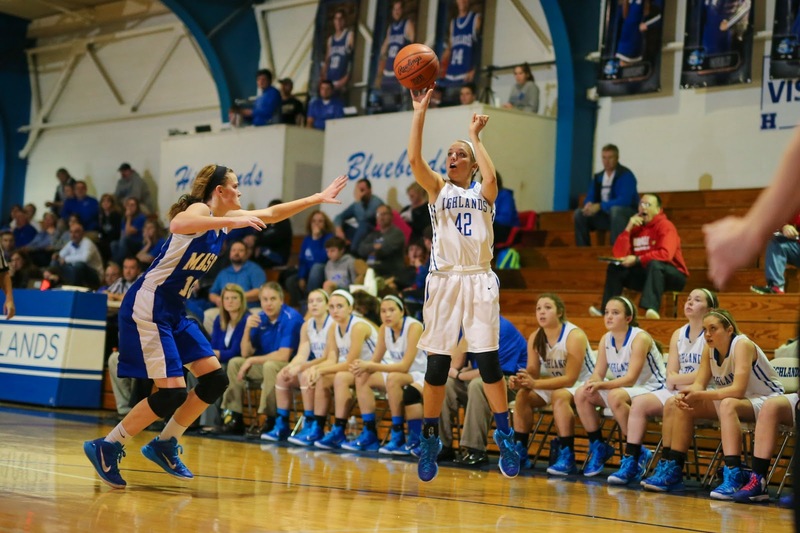 Adler scored 15 points as the Ladybirds downed the Lady Crusaders, 61-42. The Highlands Ladybirds basketball team quickly put to rest the bad taste from Saturday. The Newport Central Catholic Thoroughbred girls put up a good fight against one-loss Covington Holmes on Monday. PHOTO: Allen Ramsey, DWCPhoto.com. Highlands eighth grader Zoie Barth (14) goes up for a shot against Holy Cross senior Ally Mayhaus in Saturday's 9th Region battle. The Ladybirds fell 40-39 in overtime. 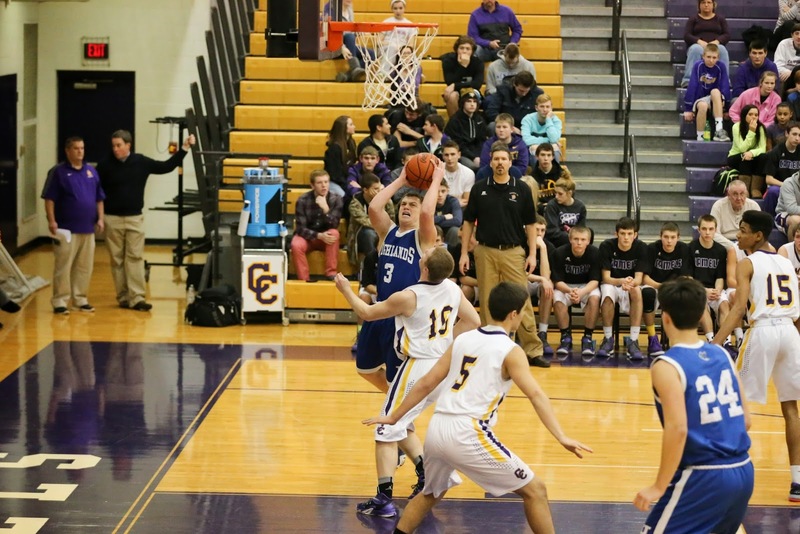 COVINGTON – They may have lost this overtime battle. PHOTO: Allen Ramsey, DWCPhoto.com. Newport Central Catholic senior guard Zack Pangallo soars in for the score in Saturday's game against St. Henry. The Thoroughbreds claimed their third straight All "A" 9th Region crown with the 85-44 win Saturday at Covington Holy Cross. The Newport Central Catholic Thoroughbreds did not have any bumps in earning another trip back to the All “A” State Tournament. 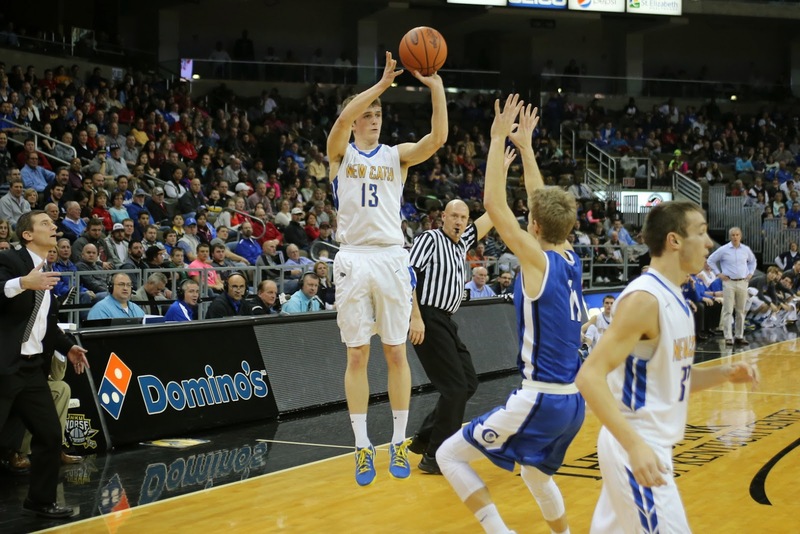 Newport Central Catholic's Grant Moeves (13) puts up a shot in a recent game against Covington Catholic. 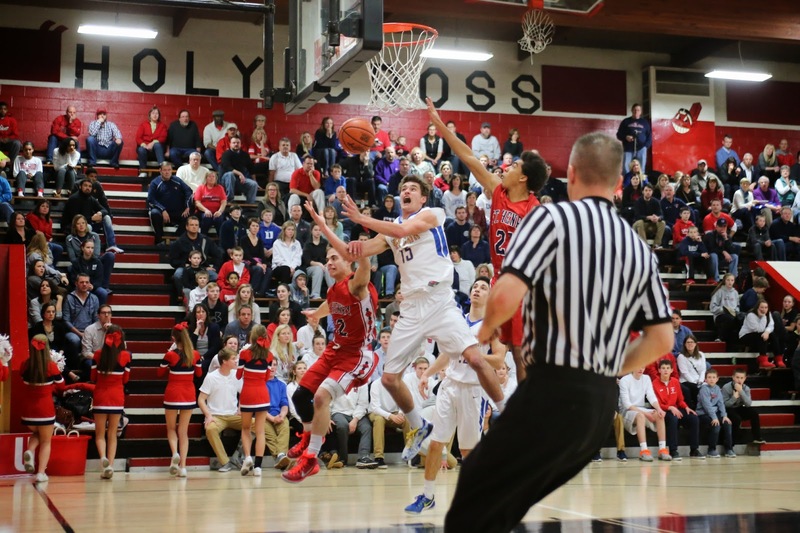 The Thoroughbreds play St. Henry for the All "A" 9th Region title at 7 p.m. Saturday at Covington Holy Cross. The Newport Central Catholic Thoroughbreds boys basketball team unsurprisingly recorded its 12th consecutive All “A” 9th Region semifinal contest. PHOTO: Allen Ramsey, DWCPhoto.com. Highlands senior Parker Harris (10) fires up a three-pointer in Thursday's game against Campbell County. 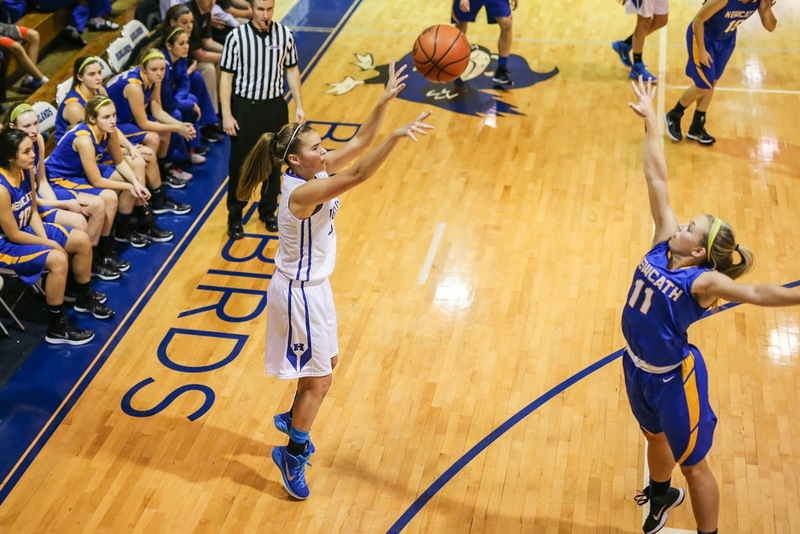 Harris scored 27 points in the Bluebird loss. 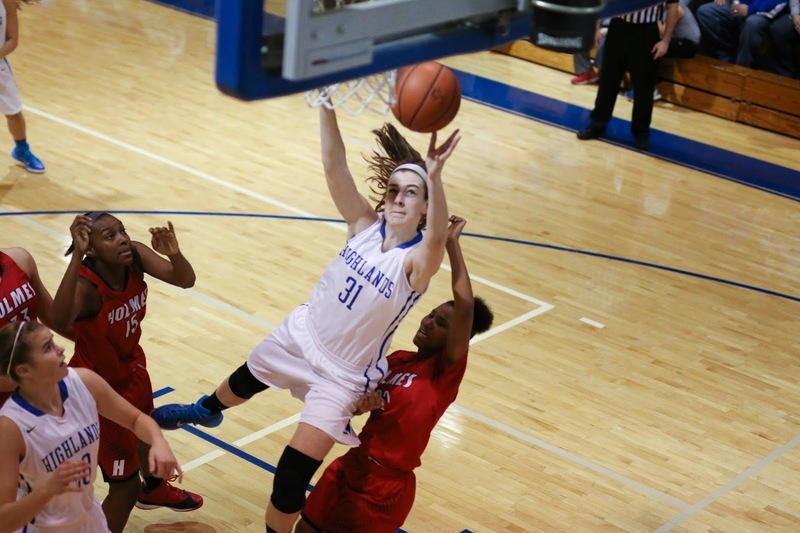 The Highlands Bluebirds (6-9 overall) saw their four-game winning streak snapped in a 73-46 loss to the defending 10th Region champion Campbell County Camels (15-6) on Thursday. PHOTO: Allen Ramsey, DWCPhoto.com. 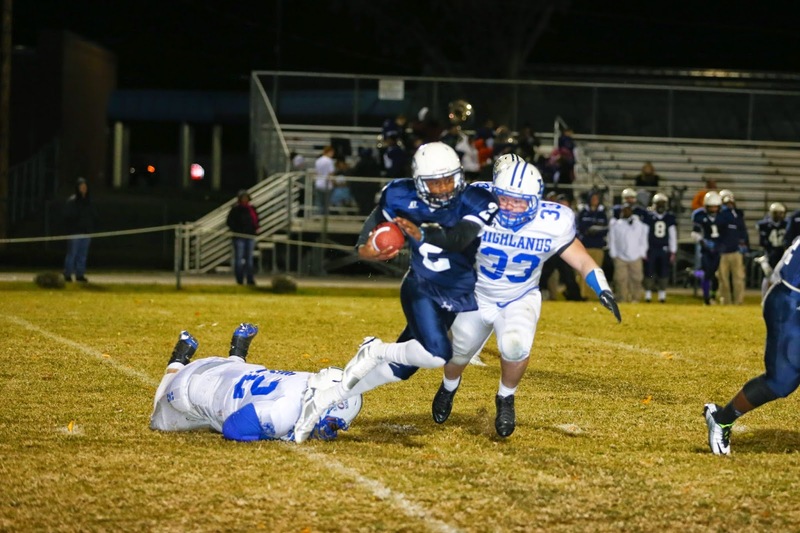 Highlands linebacker Patrick Schoepf (33) goes for a sack in a game in 2014 against Warren Central. Schoepf will be one of 26 seniors to graduate this spring from the latest state championship team. 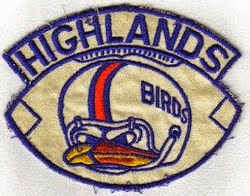 The Highlands Bluebirds football team may have a state-record 23 state championships including seven in the last eight years. PHOTO: Allen Ramsey, DWCPhoto.com. 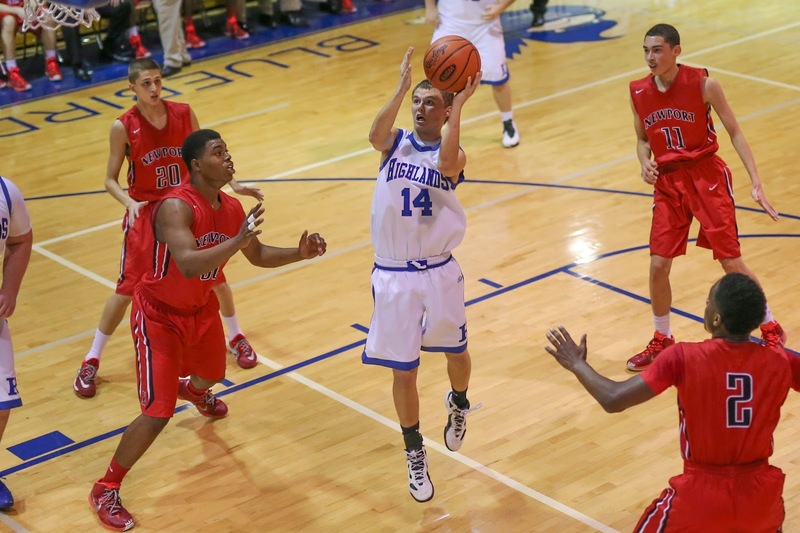 Highlands senior Alex Combs (42) fires up a three-point shot in Tuesday's game against Mason County. Highlands won 54-37 to move to 16-1 on the season. The Highlands Ladybirds basketball team rolled to another sound victory Tuesday to move to 16-1 on the season. PHOTO: Allen Ramsey, DWCPhoto.com. Newport Central Catholic's Drew McDonald (34) goes in for the score in Friday's game against Covington Catholic. The Thoroughbreds moved to 12-3 at the midway point of the regular season with an 84-29 win over Villa Madonna to open the All "A" 9th Region Tournament on Monday. 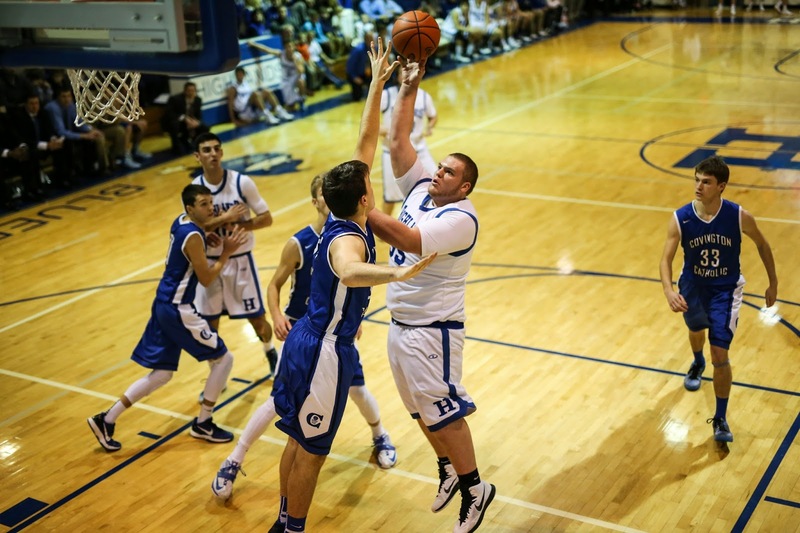 The two-time defending All “A” boys basketball state champs had little problem in the 9th Region opener Monday at Covington Holy Cross. PHOTO: Allen Ramsey, DWCPhoto.com. Highlands junior Mitch Cain (middle) makes a move in a recent game. Highlands beat Dayton, 55-47 Saturday for its third straight victory. 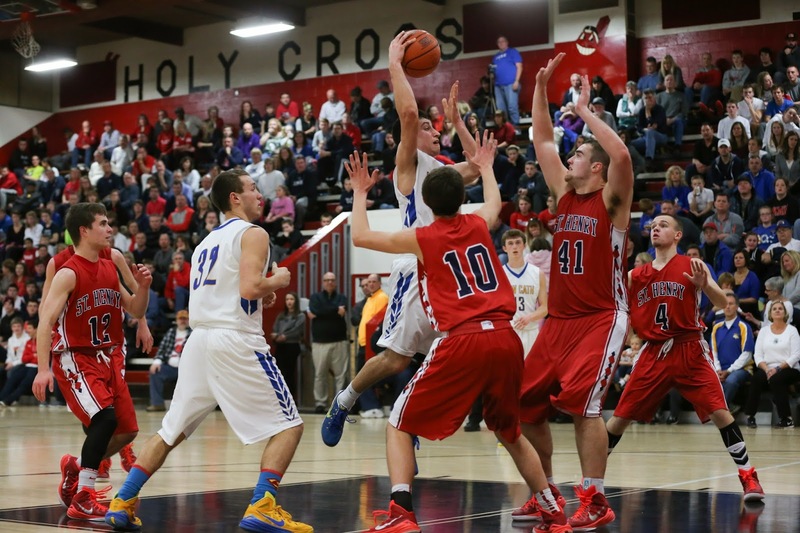 The Highlands Bluebirds have been playing some good basketball lately. PHOTO: Allen Ramsey, DWCPhoto.com. Highlands senior Lydia Graves sets up for a shot in a recent game. Highlands handled Ryle, 65-40 on Friday to improve to 15-1 on the season. Opponents from the 33rd District have been lucky to come within 21 points of the Highlands Ladybirds basketball team this season. PHOTO: Allen Ramsey, DWCPhoto.com. Highlands junior Mitch Cain (5) puts up a shot in a game earlier in the week. 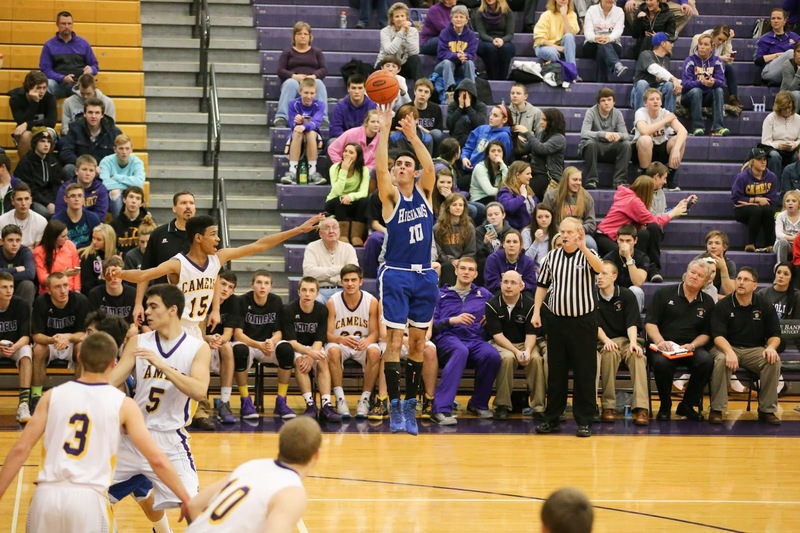 Cain scored 16 points to help the Bluebirds win their first 9th Region contest of the year at Ryle on Thursday. 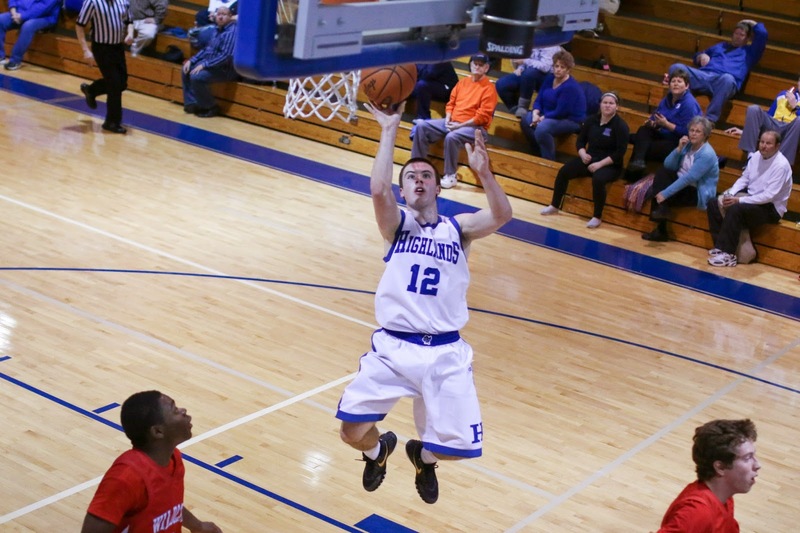 The Highlands Bluebirds basketball team earned its first 9th Region win on the road Thursday. PHOTO: Allen Ramsey, DWCPhoto.com. Highlands setter Kaitlin Hall (30) gets in position in a match this past fall against St. Henry. Hall recently signed with NCAA Division II Spalding University in Louisville. 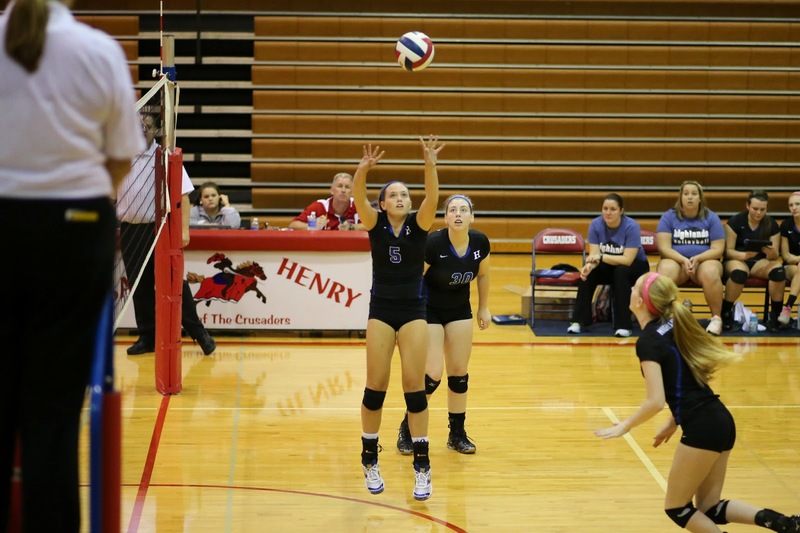 Kaitlin Hall provided a lot of stability at setter over her high school volleyball career. Her dedication to helping the Highlands Ladybirds turn the corner paid off on Friday. She signed to play at NCAA Division II Spalding University of the St. Louis Intercollegiate Athletic Conference. The school is located in Louisville. PHOTO: Allen Ramsey, DWCphoto.com. 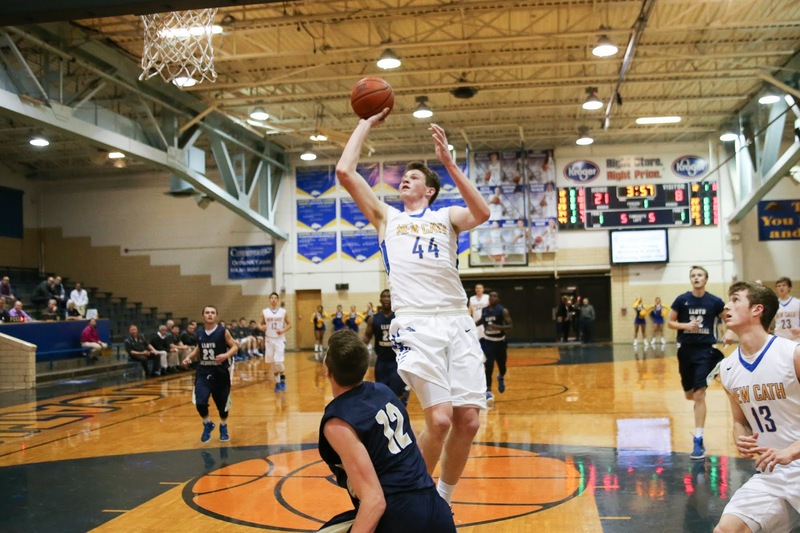 Newport Central Catholic's Ben Weyer (44) goes up in Wednesday's game against Lloyd Memorial. NewCath won 81-34 to move to 7-0 in 9th Region play. The Newport Central Catholic Thoroughbred girls basketball team (10-6) moved back into the All “A” 9th Region semifinals with a sound 71-32 win over Dayton on Wednesday. PHOTO: Allen Ramsey, DWCPhoto.com. 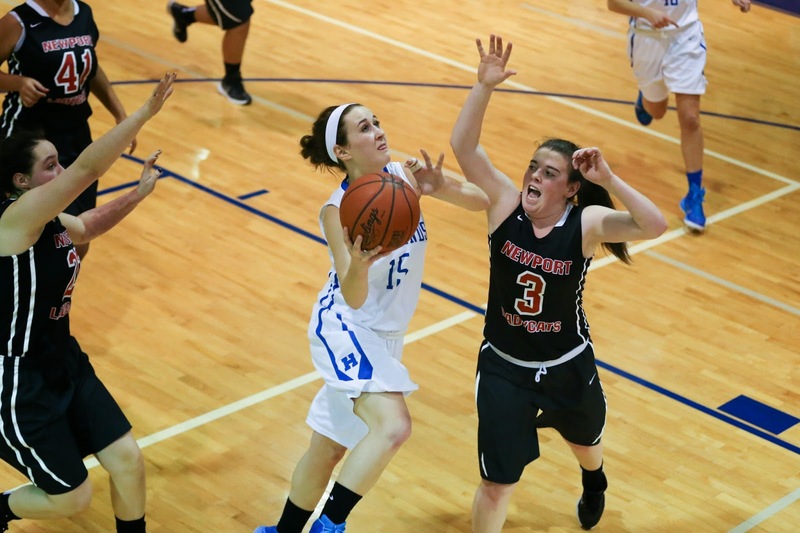 Highlands sophomore Kierstyn Clukey (middle) makes a move to the basket in a recent game at Notre Dame. Highlands moved to 14-1 with a 75-54 win over Cooper on Tuesday. 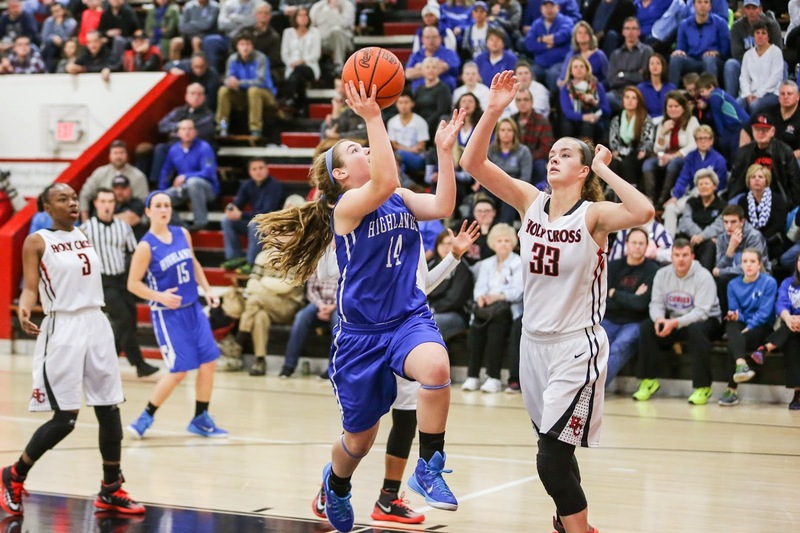 The Highlands Ladybirds basketball team has just one blemish halfway through the season. PHOTO: Allen Ramsey, DWCPhoto.com. Highlands junior Nick Kendall floats in for two in Monday's game against Finneytown (Ohio). Kendall scored 13 points in the 76-64 Highlands win. 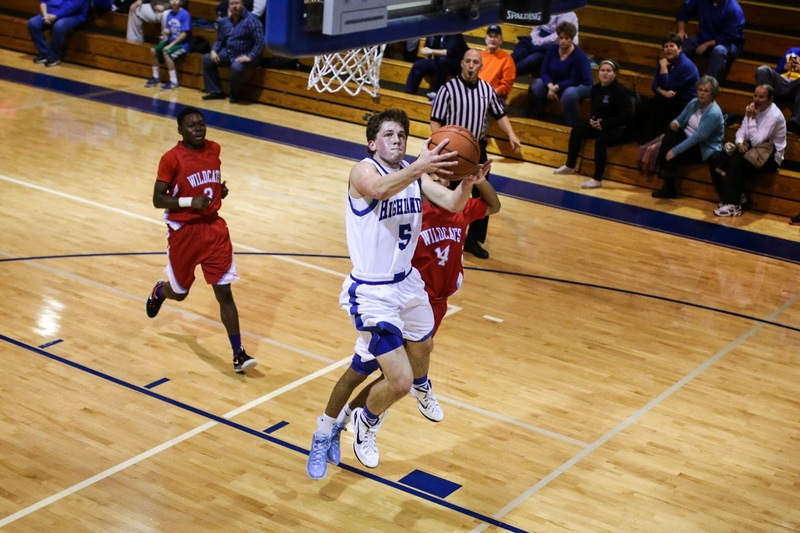 The Highlands Bluebirds basketball team stopped a three-game losing streak with a 76-64 victory over Finneytown (Ohio) on Monday in Fort Thomas. PHOTO: Allen Ramsey, DWCPhoto.com. 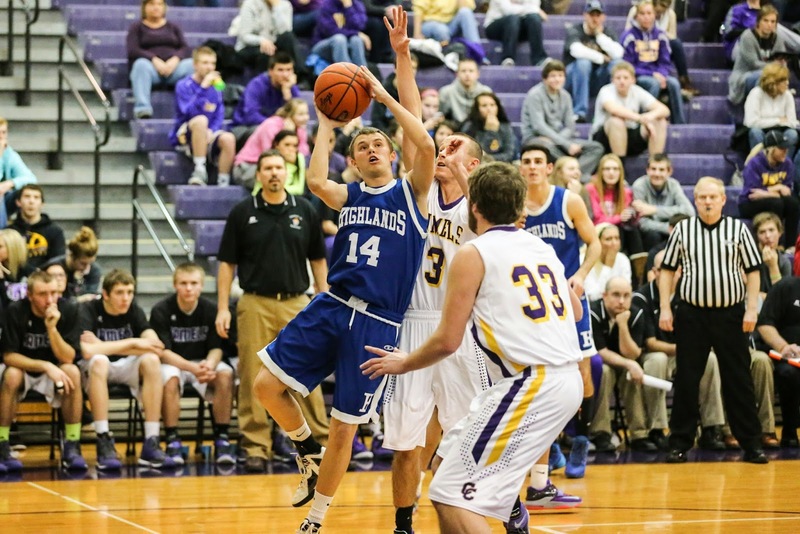 Highlands senior Justin Weyer (14) puts up a shot in Saturday's game against Newport. Weyer scored 15 points in the Highlands loss. PHOTO: Allen Ramsey, DWCPhoto.com. Highlands junior Mitch Cain (right) drives in the 36th District contest against Newport on Saturday. Cain scored 12 points. The Highlands Bluebirds basketball team players seemed to be getting their feet under them in recent weeks. But now the Bluebirds have to deal with the loss of their leading scorer for potentially a few weeks. Senior Parker Harris entered Saturday’s 36th District home game against the Newport Wildcats averaging about 15 points per game. But he went out with an apparent leg injury in the first half and may be out a few weeks after scoring two points. PHOTO: Allen Ramsey, DWCPhoto.com. 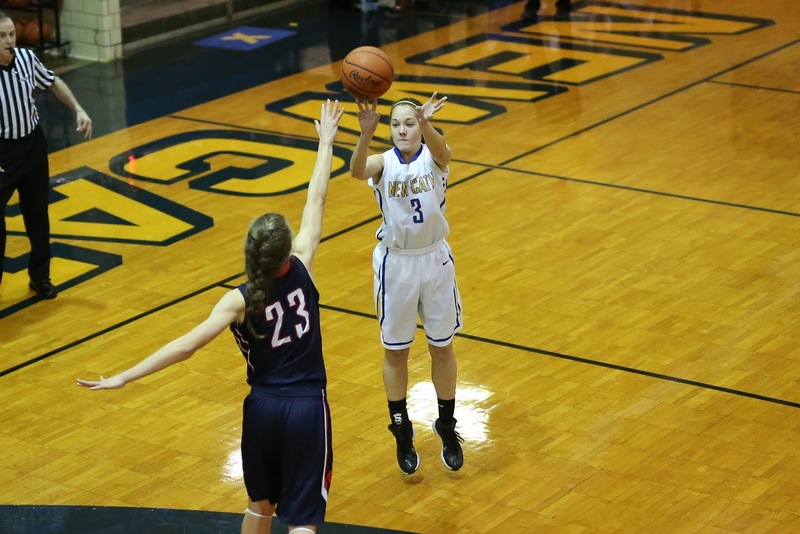 NewCath's Ansley Davenport (3) fires up a shot in Saturday's game over Sacred Heart's Grace Berger (23). Davenport scored 17 points in the 52-45 Throughbred loss. The Newport Central Catholic Thoroughbred boys basketball team knocked off South Knox (Indiana) on Saturday at New Castle (Indiana). The 9th Region girls basketball showdown between the Highlands Ladybirds (13-1) and Covington Holy Cross Lady Indians (11-3) was postponed because of sickness. PHOTO: Allen Ramsey, DWCPhoto.com. Highlands junior Haley Coffey (15) goes in for a score against Newport's Star Yeager (3) in Tuesday's game. Highlands travels to Covington Holy Cross on Friday at 7:30 p.m. The Highlands Ladybirds have been as dominant as expected with an impressive 13-1 record. PHOTO: Allen Ramsey, DWCPhoto.com. Highlands senior Kristyn Lukjan (40) applies pressure while Haley Coffey (15) and Alex Combs (42) along with Newport's Kelis McGuire (22) watch. 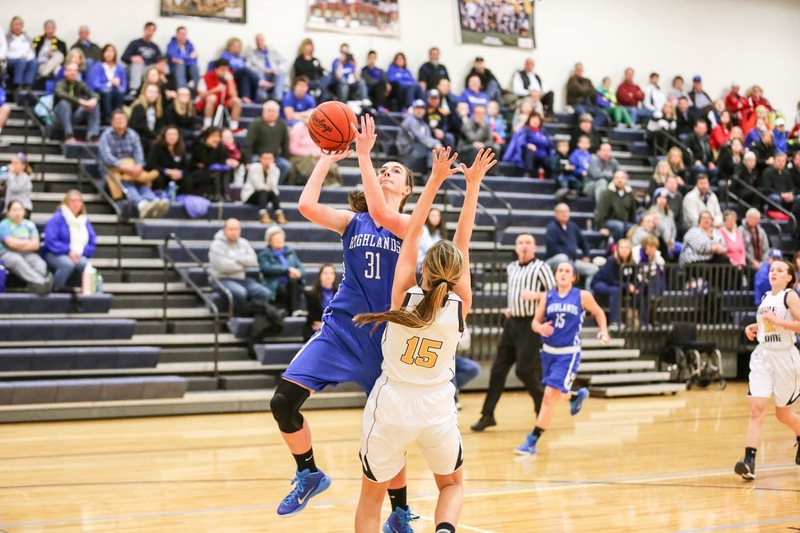 Highlands moved to 13-1 and clinched another outright 36th District top seed with the win. The Highlands Ladybirds will enter the 36th District Tournament as the undisputed top seed for the second straight year. PHOTO: Allen Ramsey, DWCPhoto.com. Highlands junior McKenzie Leigh (31) goes up for a shot against Notre Dame's Allison Gribben in Monday's game. Highlands won 42-34. PHOTO: Allen Ramsey, DWCPhoto.com. 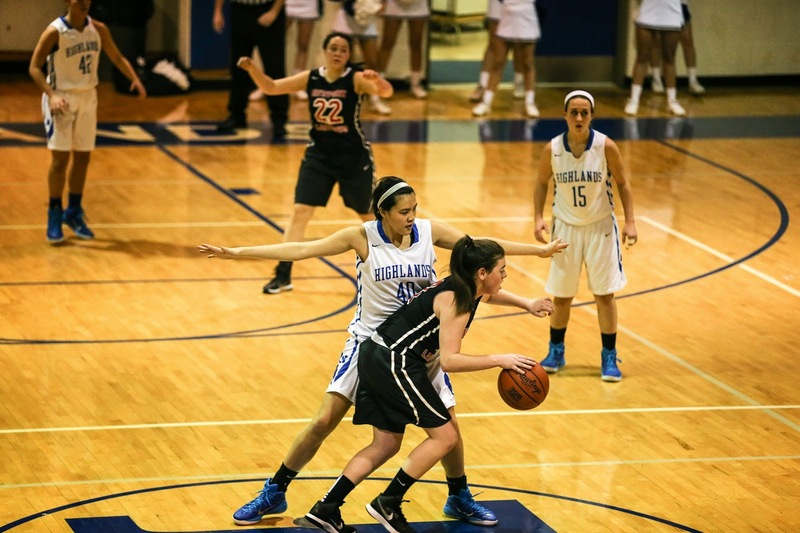 Highlands juniors Haley Coffey (15) and Brianna Adler (10) battle for a rebound in Tuesday's game at Notre Dame. Highlands beat the Pandas for the first time since 2010. 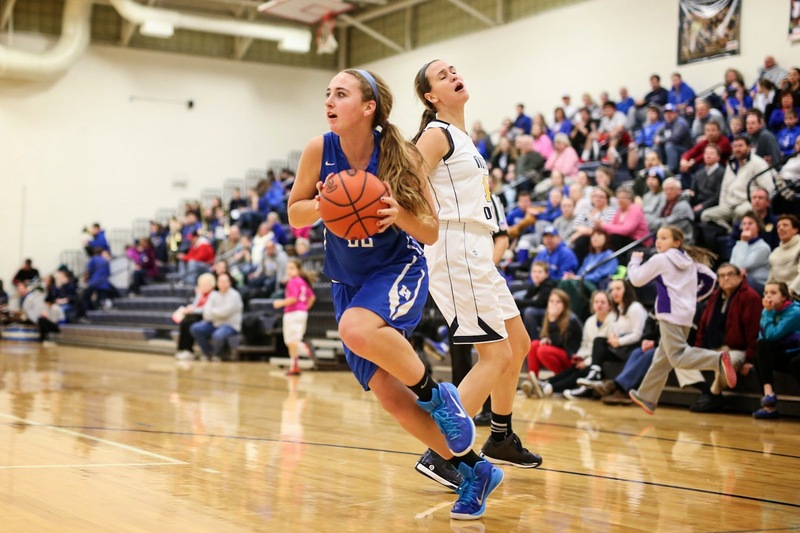 The rival girls basketball team may be down from previous years. PHOTO: Allen Ramsey, DWCPhoto.com. Highlands senior Lydia Graves (left) puts up a three-point shot over Newport Central Catholic's Michaela Ware (11) in Saturday's game. 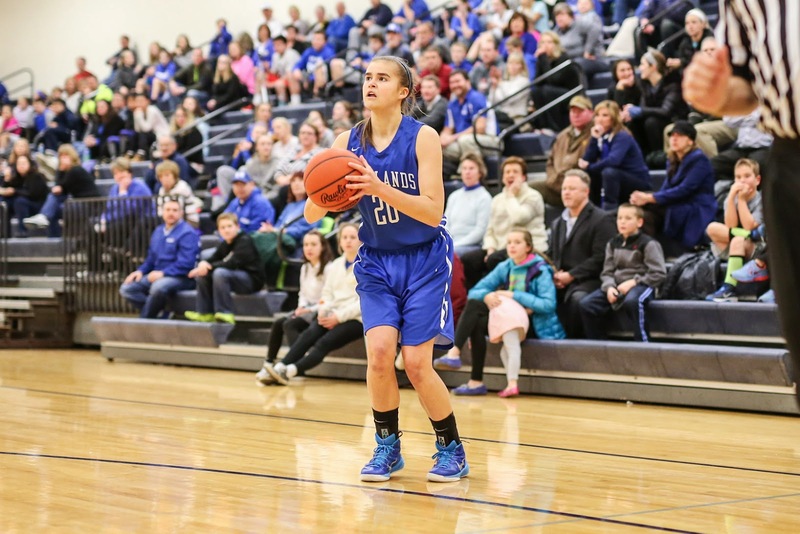 Graves made four three-pointers for 16 points in the 62-31 Highlands victory. 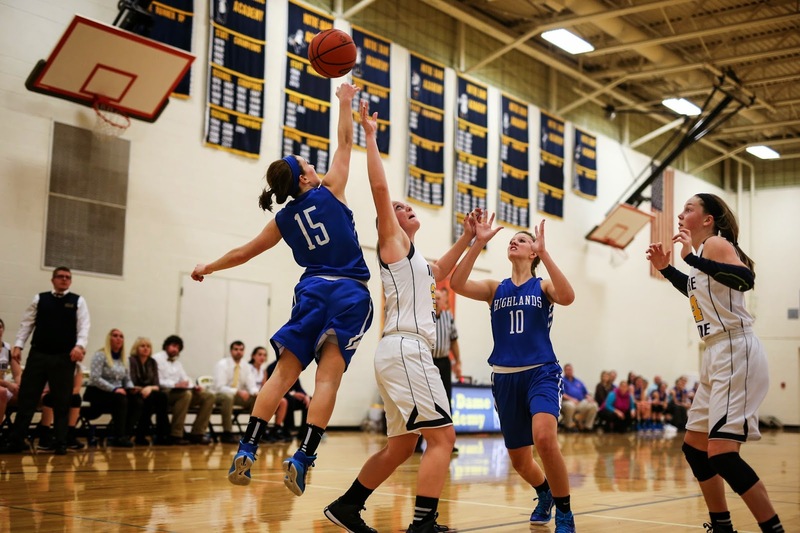 There have been a number of great games in this girls basketball series throughout the years. PHOTO: Allen Ramsey, DWCPhoto.com. 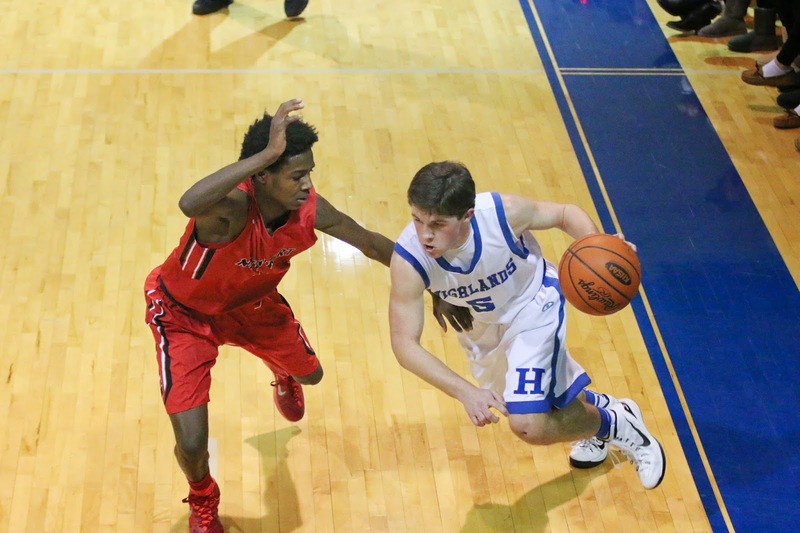 Highlands junior Bo Hebel (center) puts up a shot in Friday's game against Covington Catholic. The Colonels won 70-37. 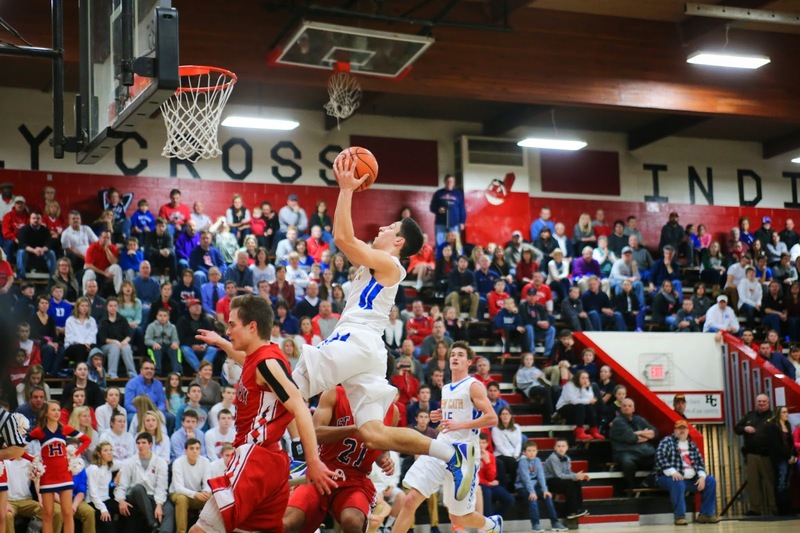 The Highlands Bluebirds basketball team could not upset the defending state champions Friday in Fort Thomas. The Highlands Ladybirds basketball team took third place in the LaRosa’s Holiday Classic in resounding fashion Wednesday.